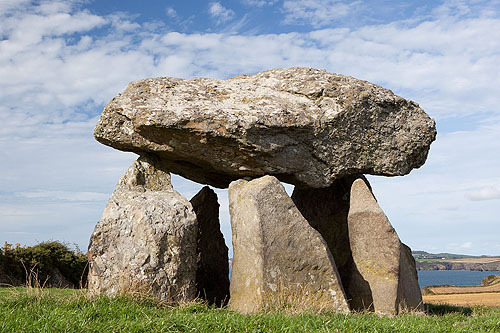 Carreg Sampson (RCAHMV 's spelling), the remains of a spectacular chambered tomb , a 5,000 year old Neolithic burial chamber (Dolmen- Cromlech in welsh) . The capstone (of Conglomerate ), is 4.7m by 2.7m and 1.0m thick, resting on 3 of 6 upright stones , 1.1m-2.2m high, defining a chamber . The whole structure was once covered by a mound of earth or stones. Legend has the Celtic Saint "Samson" creating the monument by flicking stones from the island in Abercastle harbour with his little finger. Excavation in 1968, revealed that the monument had been raised over an ill defined pit, at least 5m by 8.0m and 0.8m deep, filled with clay and stones. Finds included a small quantity of burnt bone, probably human, pottery and flint. The lost entrance passage was to the North West. In recent times, the gaps between the uprights were filled with stone, and the chamber was used as a makeshift sheep shelter.